6/12 Months - $40.99 Only 9 left! It's baby's first Halloween so here you sit, browsing our vast selection of infant costumes. There's so many to choose from and they're all so adorable, plus your bundle of joy will be strikingly cute in every single one so how does a parent decide? Please allow us to assist with this costume conundrum because we know a thing or two about dressing up and one of our favorite pastimes is staring at squishy newborns swaddled in disguises. Our top contender for best baby costume goes to this...*drumroll please*... Goofy baby costume! And we'll gladly explain why. First off, it's common for parents to introduce their babies to Disney characters from the start because they're timeless cartoons kids love to watch. They're silly and laughing is a must for little ones. (Heck, we still find them funny as we venture into our mid-30's!) Anyway, Mickey Mouse's BFF, Goofy, and babies have more in common than you think. They both make funny faces and their irresistible charm is endearing to everyone. 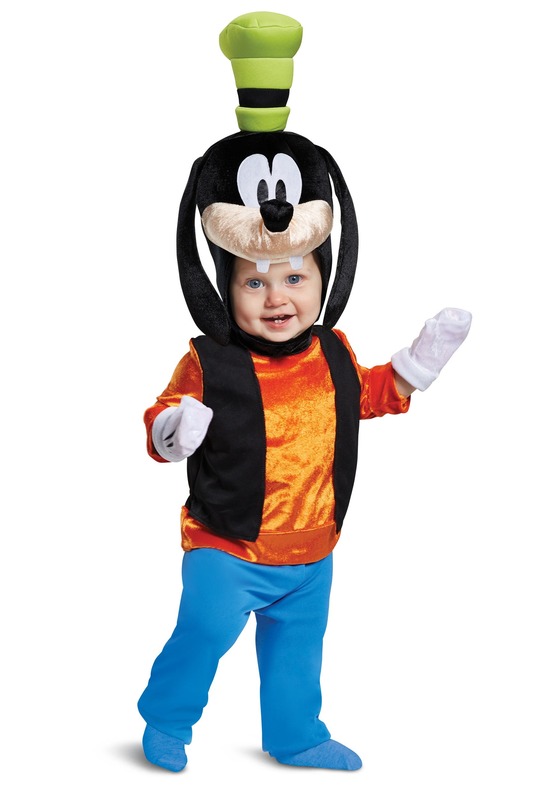 The Goofy costume is also the perfect option for Halloween because admirers will make goofy faces when fawning over your precious little one dressed as a mini Goofy. Comfortable for kids ranging from 12-18 months of age, this costume comes with a soft orange top with an attached black vest for a colorful and cartoonish look. The blue pants feature an elastic waistband so they stretch over pudgy bellies with ease. The white mittens are included and the Goofy headpiece is extremely plush and fastens under the chin for a snug fit that won't slide down or fall off. We have a costume tip that will make all your Halloween dreams a reality. Dress as Mickey or Minnie Mouse to create a parent/baby costume that shows imagination, creativity, and inspires others to say, "Gawrsh they're cute!"